Heading into February, there are many indications that San Francisco’s real estate market is poised for positive movement: The government shutdown is over (for now), and the stock market has recovered from its free fall at the end of last year. Interest rates have trended down in recent months. And the next wave of tech companies, including behemoths like Pinterest, Airbnb, Uber, and Lyft, are gearing up for IPOs, which would flood the city once again with new money, at least among a number of lucky employees. But renewed concerns about a trade war with China and indications of a potential global market slowing could add volatility here. All that said, anecdotally I’m seeing far more activity in the market than normal this winter. I have an active 3BR/2BA listing in desirable Potrero Hill, and just put another quaint TIC on Lake Street into contract. Hungry buyers are taking advantage of the generally slower conditions to snap up properties at less competitive prices than during the more frenzied spring and fall selling seasons. Opportunities abound for both buyers and sellers right now. Overall, major trends remain constant, as illustrated in the charts below: Single-family homes get scarcer and therefore more expensive. 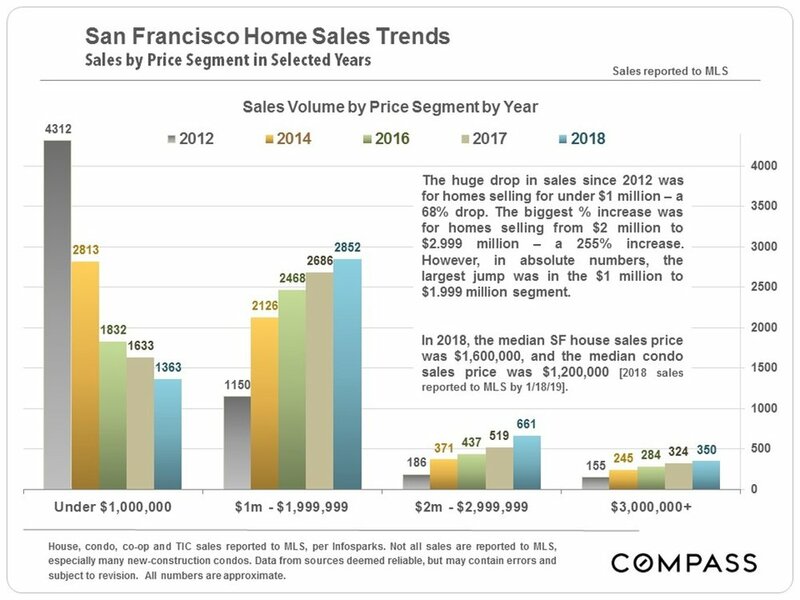 Since 2012, the number of sub-$1M house sales in San Francisco has dropped by 68%, while the number of houses sold in the $1-1.99M range has gone up by more than 2.5x. Condos do appreciate, of course, but less aggressively. You’ll notice some fluctuations that occur when spates of new construction units hit the market. What this chart doesn’t illustrate is that those fluctuations vary a lot by neighborhood. SoMa, for example, is where the most new units have been coming in, so those prices tend to be more inelastic (which makes them a potentially good opportunity for buyers who are weary of competitive overbidding. Do you have further questions about the state of the market? I’m happy to have a conversation and clarify any of the above, or other questions you have. Contact me, and we’ll chat.